Public art = art forms incorporated into the fabric of the community and defined by citizen participation. Beyond artwork located in a public space or a memorial or sculpture placed on a plaza, public art can be a visual representation of shared values. When properly integrated, public art enhances the environment, creates a sense of place, expresses a community’s values and identity, and can bring creative people together to find solutions to a community’s infrastructure and social challenges. As part of the overall community design, artists can build a visual vocabulary of places, forms, patterns and materials that describe a community’s unique qualities. Through the N.C. Arts Council’s Creating Place Program, more than 30 public art planning or implementation grants have been awarded. Grants for public art visioning and planning have resulted in Master Plans for the communities of Asheville (1% for art program), Hendersonville, Hickory, Chapel Hill (1% for art program), Cary, Wilson, and Kinston. Public art planning in Raleigh and Burlington was also supported. Other notable planning projects include: a design competition for a Floyd Flood Memorial in Greenville, a fanciful Tribute Garden to the late folk artist, Minnie Evans at Airlie Gardens in Wilmington, interactive playground components for special needs children at the Paul Braxton Center in Siler City, and a significant gateway project for the Town of Cary. Public art implementation projects have included a community-based, tile table and bench project in Spruce Pine, the initial artwork for a fishing heritage trail in Morehead City and a series of colorful concrete fern-like sculptures along a portion of the Perry Ruddick Nature Trail at the Center of Craft, Creativity, and Design in Hendersonville. 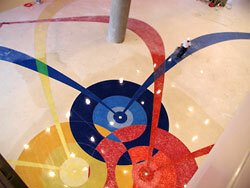 The N.C. Arts Council also administers the State of North Carolina Artworks for State Buildings Collection of installations commissioned between 1982 – 2000 through percent for art legislation.